PHOTO CAPTIONS: 1-5. 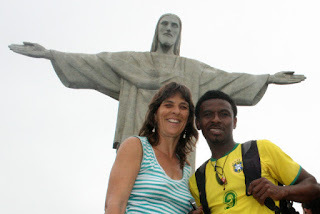 Andre and me, as well as millions others, pose with the Cristo statue, 6-7. 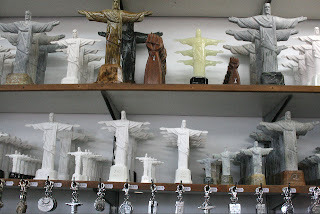 Cristo souvenirs, 8-9. Friends in high places, 10-12. 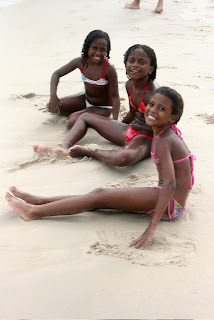 Friends at Ipanema Beach, 13. 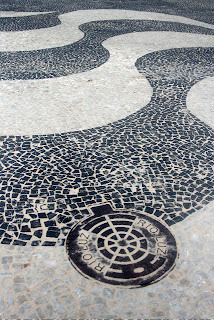 Famous walkway at Copacabana beach, 14-15. End of the day, 16-17. More beach shots. Who can resist? 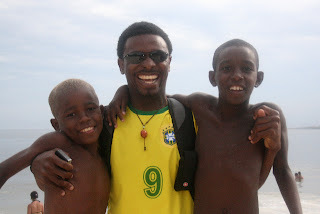 Friday, Jan. 4, 2008: I wish I could say we’re splurging on a $60 hotel room, but actually it’s the cheapest thing we could find here in sweltering (100 degree F), overcrowded, over-priced Ipanema. It’s like Miami Beach during Spring Break, only hotter. After trudging all around the area, only to find everything fully booked, we finally resigned ourselves to a prison cell room with a bunk bed, dresser and two noisy fans. We had to sweep the sandy floor and put on the sheets ourselves. The bathroom with cold water is one floor down. If we wanted hot water – as if! – that’s available on the first floor. The guy couldn’t find the neighbor’s Wi-Fi password for my laptop, so luckily there’s a computer for everyone to share in the “lobby.” After inquiring several times about a key to lock our room, we finally gave up, so I’ve been wearing my money belt and carrying my laptop and cameras everywhere I go. Grouchy Andre claimed Rio was all my idea. 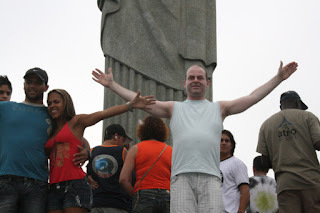 However, I clearly remember him saying he wanted his picture with the famous Cristo statue. 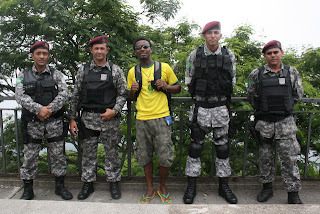 I would have liked to fly from Buenos Aires to Salvador de Bahia, the most interesting and most African part of Brazil, according to my traveler friends. But when I looked up the flights, Salvador was twice the price of Rio. 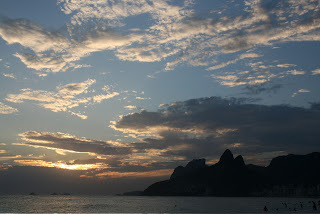 The bus would have been cheaper, but it takes 45 hours to Rio and another 24 to Salvador. So here we are. 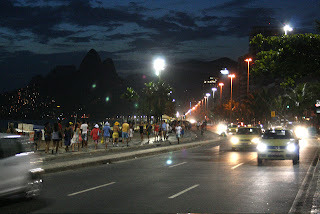 Actually, once we both calmed down, and the temperature dropped slightly, we enjoyed walking along the famous Ipanema Beach. The women are world-class gorgeous and the bathing suits skimpy. Supposedly, the same word in Portuguese means bikini and dental floss. I remember a song from my childhood that goes: “She wore an itsy-bitsy teeny-weeny yellow polka-dot bikini for the first time in history.” Well, you won’t catch me in one of those, even in Rio. Sorry, guys. 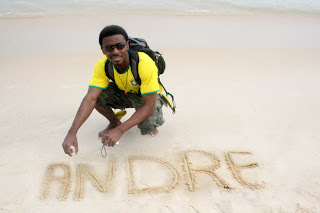 Andre had a hard time remembering the names of the beaches, Ipanema and Copacabana, but again, a song came to my mind: “Tall and tan and young and lovely, the girl from Ipanema goes walking and when she passes, each guy she passes goes, ‘Ahhh.’” I was even going “Ahhh” myself. 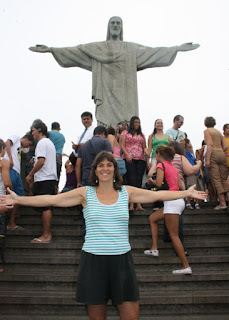 Saturday, Jan. 5, 2008: Of course, we had to visit the famous Christ statue overlooking the city. 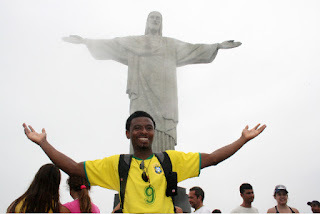 According to the guidebook, he’s spreading his arms as if he’s about to dive into the bay. We had to wait an hour-and-a-half and pay $20 each for a round-trip ticket on the train/trolley to the hilltop, but it was well worth it. I especially loved watching all the people pose for photos, many with their arms outstretched, as if they were ready to dive into the bay as well. Just our luck, the day was foggy and misty with absolutely no view of the city or water below. But good news, the heat had backed down to a comfortable 80 degrees., a bit cooler than the night before. The tram reminded me of the one to Victorian Peak in Hong Kong that Maya and I rode together, so I sprinkled some of her ashes out the window as we passed the Jardim Mil Flores, Garden of 1000 Flowers. Afterwards, Andre and I walked the entire length of Copacabana, definitely one of the world’s longest stretches of white sandy beach. Even though it wasn’t as hot as the day before, the beach was packed with families, couples, kids, and vendors. We bought coconut juice, a skewer of BBQ shrimp, something they call tapioca that has no resemblance to pudding, and homemade mango ice pops. Who needs lunch? Sunday, Jan. 6, 2008: We went to a big arts & crafts fair in the plaza. Some of the items reminded me of street fairs in Santa Cruz. 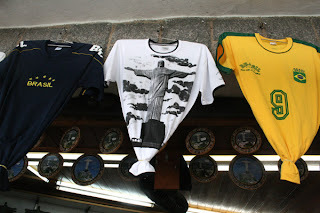 But there were also lots of Rio souvenirs. 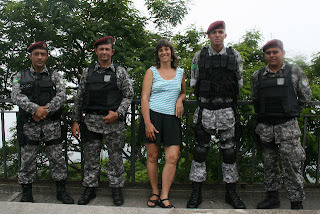 And of course we had to buy some, despite the high prices -- a Kaká (don’t laugh. He’s probably the best Brazilian soccer player today) t-shirt for Andre’s little nephew Joel; a safari hat with the Brazilian flag on it for Andre and he actually wears it; 2 picture frames with “Maya Angela” written in colorful letters, one for me, one for Daniel; a sarong of the Brazilian flag which we’ve been using as a beach towel; and a little handmade purse I couldn’t resist. 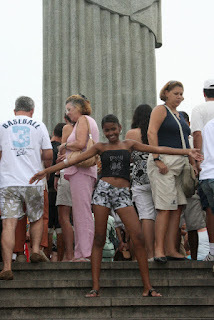 We walked over to Ipanema Beach again and I decided to go into the water. Andre listened to his iPod and watched our stuff while I went back and forth between the ocean and the trash can. I fished out all kinds of garbage, including a ton of plastic bags, candy wrappers, milk cartons, two aerosol cans, and the door to a dorm fridge. Andre asked me if I thought I could clean the whole ocean. No, but I like to do my little bit. Suddenly I remembered my money belt, which unfortunately, was still around my waist. We laid out the travelers’ checks, cash from several countries, yellow fever certificate, and passport in the sun to dry. All were salvaged by some miracle. We discovered a nice buffet next door to our hostel for our last meal in Rio. Like so many in Brazil, they weigh your plate after you pick out what you want and charge you accordingly. I like that better than normal buffets which encourage overeating. I even had some tofu and sushi. Andre likes Brazilian food because it reminds him of Haitian food. The two cultures are very close, with their African roots.